Parramatta Stadium or Pirtek Stadium after the names of the official sponsors is a sports stadium located in the Parramatta suburb of Sydney. 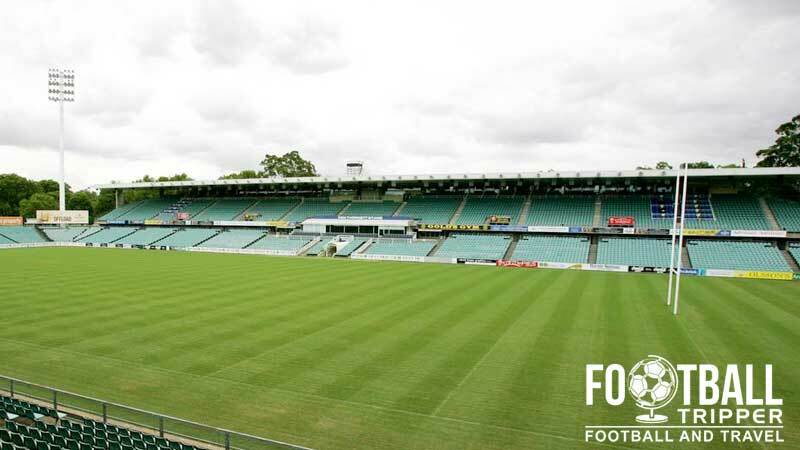 Pirtek Stadium was built on the historic sight of the Cumberland Oval in 1985 and is currently home to two sports clubs: Parramatta Eels and A-League side, Western Sydney Wanderers. 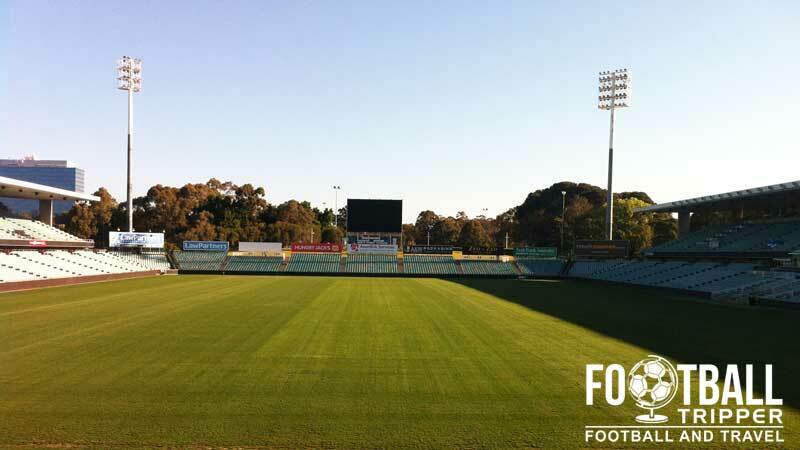 Sydney’s Parramatta Stadium is the second sports venue to sit on the site with the first pitch used primarily for cricket and known as the Cumberland Oval, a name which some fans still use to refer to the ground today. Dating as far back at the mid 19th century it was clear to the New South Wales Government that the facilities desperately needed modernising with the design put out to tender in 1983 and completed two years later. In 2002 just under twenty years after the stadium initially opened work began to decrease the total capacity of the stadium by 5,500 when two grass verges named after Rugby Players Brett Kenny and Peter Sterling were converted into proper stands complete with plastic seats. Seen as essential to the long term future of the stadium, a commission was also established in 2010 charged with creating a “master plan” through renovations. The result was $28 million plan to expand the stadium up to 24,700, improve the concourses and VIP facilities as well as the internal facilities including the players locker rooms and gym facilities. Expected to be complete by the end of 2015, fans group the Red & Black Bloc have campaigned for the installation for German style rail seating which would be a first for sports in Australia. Initially used by Sydney F.C who used the stadium for a handful of fixtures in the AFC Champions League in 2007 and against Perth Glory in the 2009/2010 season, the stadium has now come to be the home of the Western Sydney Wanderers who announced a five year deal to use the Pirtek Stadium on 26th July 2012. 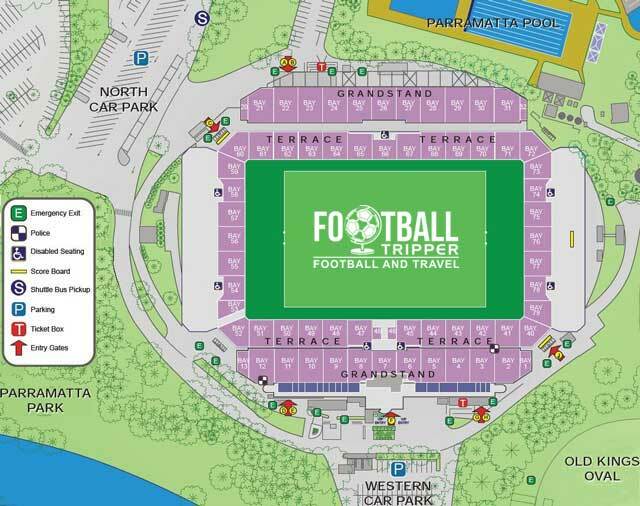 Parramatta Stadium consists of the following four stands: North, East, South and West. Between Pirtek Stadium and Parramatta railway station there are a good number of watering holes to consider which certainly makes the 25 minute or so walk much more enjoyable. The first bar worth considering is P.J Gallagher’s Irish Pub, followed by the Bavarian Bar Café which is located on Marsden Street. After crossing the river there is a pub within The Royal Oak Hotel which comes highly recommended, and then finally there is a bar within Parramatta Leagues known as Trophy’s Bar & Grill which is two minutes north of the stadium. Once you are at Pirtek you can purchase pints of XXXX Gold Australian Lager, spirits with mixers and Wine by the glass. All of which are of course served chilled. Fast food fans are spoilt for choice as there are numerous franchises within 5 minutes of Parramatta sports complex such as McDonald’s and Nandos on Victoria Road, and KFC and Pizza Hut five blocks north on Church Street. Inside the round there are 16 catering and beverage outlets which offer fans a variety of options including a dedicated subway store within Bay 44. Food on offer includes all the expected stadium classics such as Hot Dogs, Fries, Nachos, Pies, Fish & Chips, and drinks such as Tea, Coffee, Fizzy-Drinks, and Water. In addition to the various merchandise kiosks located around Pirtek on matchdays Western Sydney Wanderers also have a freshly redesigned online store. If you can’t make it to the stadium or if there isn’t a game on any time soon this is probably the best way to browse the club’s range of goods. 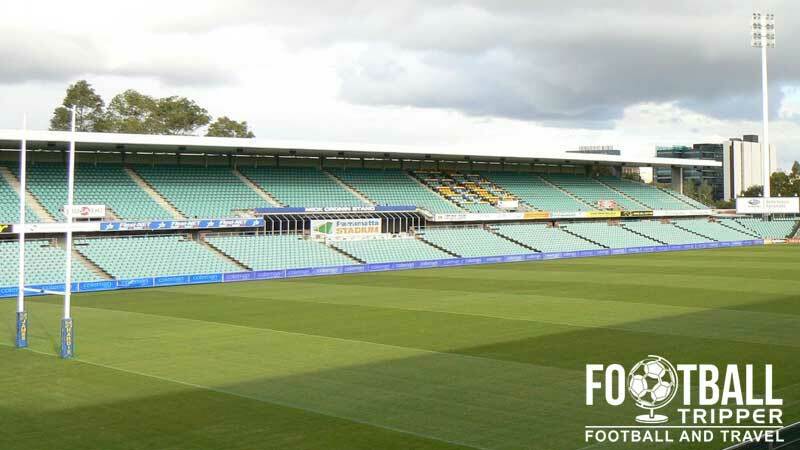 It doesn’t appear as if either Western Sydney Wanders or the operators of Pirtek Stadium currently offer fans the chance to undertake a tour of the facilities at the ground. If this changes, please let us know and we’ll update. Please note that the above ticket prices are illustrative for the 2015 season and do not include handling fee ($4.35) and payment processing fee for some credit cards. Pirtek Stadium is located less than 1.5 miles from the loosely defined centre of Parramatta which is a suburb and major metropolitan area of Sydney. The exterior of one of the large side stands complete with Pirtek sign. The club advised that there is no on-site parking available to the general public on matchdays, and that it is advisable that you take some form of public transport. Having said that there are a handful of very limited parking spaces within Pirtek Swimming Centre, as well as some reserved for disabled supporters. On matchdays there is a free shuttle bus service which runs from Parramatta City Centre to Pirtek Stadium. The boarding point is located on Argyle street which is next to the Parramatta City Council Loop bus station. You can call 02 9683 5755 for more info, and to confirm the existance of such a service. For those visiting during the week the nearest normal bus stop is located on O’Connel Street which runs east of the stadium. This is served by many routes including the M52 (Circular Quay), 545 (Chatswood via North Ryde) and M91/92 (Hurstville and Sutherland) amongst others. Pirtek Stadium is located approximately 1.8 km north-west of Parramatta Railway Station, with the resulting walk likely to take the average fan no more than 25 minutes. There are lots of services from here to around the rest of the country including the Western Line trains which can transport fans from Central Sydney, North Shore, and Blacktown amongst other places. The welcome sign for Parramatta Railway Station as found on the main platform. If you want to travel in style you can even get the F3 ferry service to and from Circular Quay, with the RiverCat terminal located around 2.km from the ground. 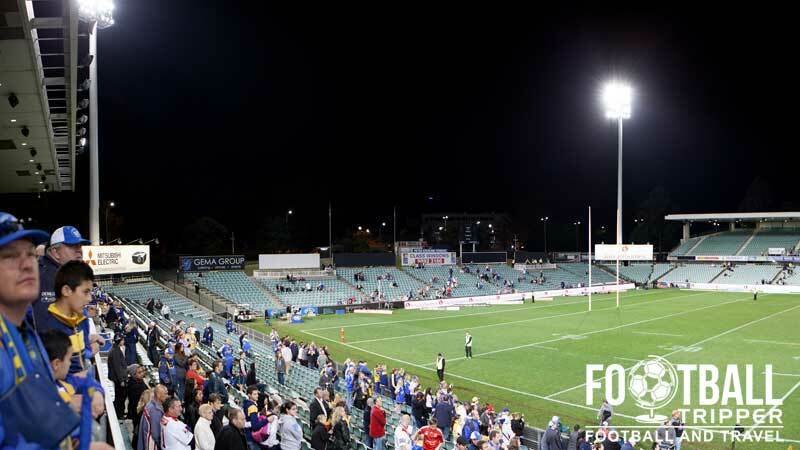 There are two or three hotels north of the Parramatta River less than 10 minutes away from Pirtek Stadium most notably Hotel Novotel, and The Royal Oak Hotel. Back towards the city on the other side of the river there is the likes of a Holiday Inn, Park Royal, and The Woolpack Hotel.